The British climate could soon become as cold as northern Canadas because global warming is slowing the ocean current system, scientists said yesterday. Researchers have found an alarming decline in the strength of a crucial Arctic current linked to the Gulf Stream, offering the first evidence that the warm current that acts as northern Europes central heating system may be weakening. Such a slowdown would be serious for Britain, bringing the harsh winters that prevail at similar latitudes elsewhere. Britain is as far north as Labrador but avoids Canadian weather because of the warm water that the current carries from the Gulf of Mexico. Temperatures in Britain are at least 5C (40F) warmer than they would be without it. Scientists have long predicted that global warming could interfere with ocean circulation, in particular the system known as Global Conveyor or Belt, of which the Gulf Stream is a part, because melting ice caps alter the density of seawater. A study of British and Scandinavian researchers has now shown for the first time that this is happening. The volume of water flowing through the northern loop of the Global Conveyor Belt, which runs from the Artic to Scotland, has fallen by a fifth over the past 20 years and the current is weakening further by 2 to 4 per cent every year, the research shows. As the cold water in this current is on its way back across the Atlantic, having been carried over from the Gulf of Mexico by the Gulf Stream, it is likely that the latter current is also being affected, the scientists told the British Association Science Festival in Glasgow yesterday. The consequences for Britain could be bleak and would reverse the higher temperatures that have been anticipated as a result of global warming. We do not yet know if we will lose the warmth it brings completely, but we must continue the monitoring work, Ms Hughes said. It seems that in the past the Conveyor Belt has stopped and started, sometimes as quickly as within one or two years. When it stops, northern Europe is cooled by about 5C and we get a climate similar to that of northern Canada. Presently, European governments are planning for climate change based on predication of slow steady warming. 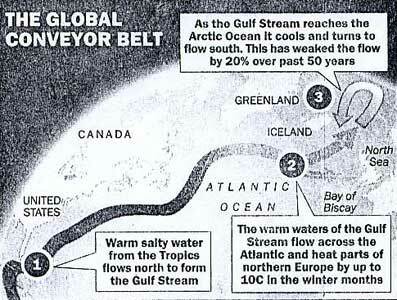 The Global Conveyor Belt works because of differing densities of warm and cool water. In the Atlantic, warm water rises in the heat of the Caribbean and drifts northwards and eastwards. When it reaches Britain, Iceland and Scandinavia it sinks, sending a cold counter-current across the ocean in the opposite direction. Extra fresh water in the North Atlantic, released by ice caps melting because of global warming, could interfere with the system because it would lower the salinity and thus the density of seawater in the region, reducing its ability to sink and sustain the current. The Gulf Stream transports 27,000 times as much energy as the maximum output of all Britains power stations, so the effect on the countrys climate would be great.